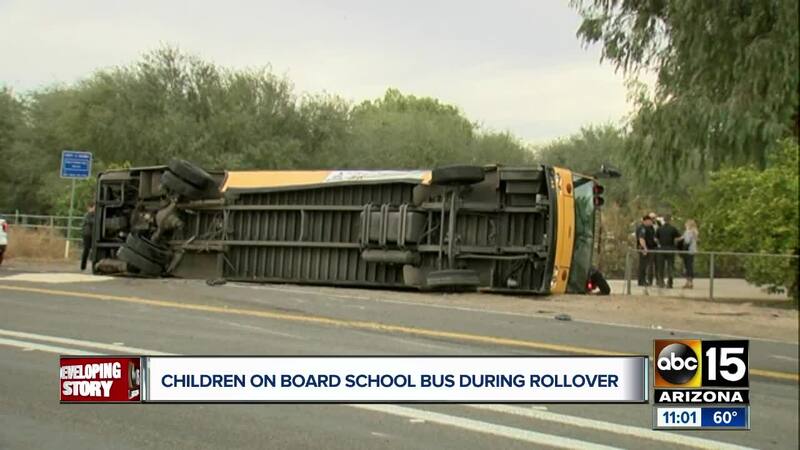 A school bus in Avondale rolled over near the intersection of Southern Avenue and El Mirage. Six children escaped serious injury Wednesday morning after their school bus was struck by a driver who ran a stop sign at a West Valley intersection. 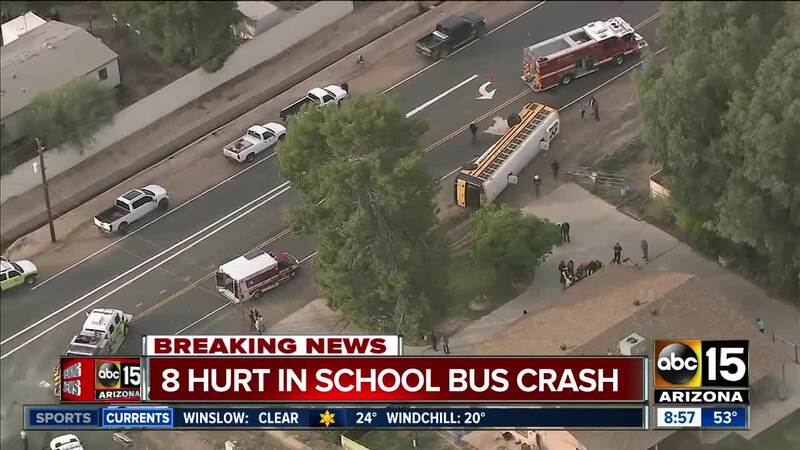 Maricopa County Sheriff's Office spokesman Bryant Vanegas said the driver of the bus was transported with minor injuries from the scene near Southern Avenue and El Mirage Road. According to Rural Metro Fire Department spokesman Shawn Gilleland, the school bus was traveling westbound on Southern just before 8 a.m., when the driver of a pickup truck failed to yield at a stop sign and struck the bus. The bus then spun out of control and tipped, landing on its side in the roadway. Gilleland said the driver and students had already gotten themselves out of the bus by the time the first rescue crews arrived. Air15 video showed two hatches on the roof of the bus had been opened. The children have since been released to their parents, Vanegas said. The driver of the pickup was not hurt, and Vanegas told ABC15 impairment and speed do not appear to be factors in the crash. Gilleland said the bus was not equipped with seatbelts. Possible charges in the incident have not yet been released.